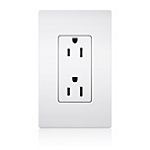 We most commonly use this with our closet light relay. This is not designed for a lot of power, so it should be used in conjuntion with some sort of relay, contact closure, or really low power device. Specifications: • Max voltage: 125V • Max current: 0.5A • Dimensions: 1-3/4" L x 1/2" H x 1/2" W with 3/8" ears • Switching distance for wooden doors and frames: 1/2" • Color: Beige.